Last Saturday, the ladies of Varina Howell Davis Chapter 2559 United Daughters of the Confederacy got together to create “cotton boll angels.” These cute little Christmas ornaments will be donated by our chapter to Beauvoir as a fundraiser. Beauvoir is located on the gulf coast in Biloxi, Mississippi. The historic home was once the place where Confederate President Jefferson Davis spent his final years after the Civil War. He wrote his memoirs there, and was surely inspired by the “beautiful view,” which is what Beauvoir means in French. However, the property was nearly destroyed by Hurricane Katrina. Since then, numerous organizations have contributed to rebuilding and restoring the premises. 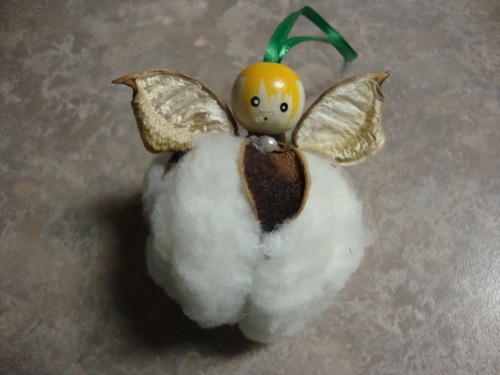 The UDC ladies made cotton boll angels last year, and all of the ornaments donated were immediately sold. If you get a chance to visit historic Beauvoir, make sure to purchase an angel to benefit the Presidential Residence.